(URC) Ebumi Masaru -- "anchor hair", two somewhat bigger hair groups sticking left and right from bottom of his head. He also stands out due to eyes often wild and almost constantly angry expressions. Are any of these styles something a Japanese teenager would actually wear? (Are some of them even possible?) Except for someone from another team commenting that Sekisan has really wild hair, these fantasy styles are treated as normal looks. The styles definitely help the characters stand out. With three tall blonds on the team, it is nice that two of them have unique appearances. Is blond hair fairly common among Japanese teenagers? The strange thing is that the series is reality based; no-one has a beyond-human-capability ability or genius move. For example, another series might have a character grow up on a dairy farm, and now he has an unbreakable grip on the rugby ball due to 10 years of milking a dozen cows twice daily by hand. In All Out!! there is nothing but tough training and a great coach. It is just ... it's just ... the fantasy hair, man. related: Name of hair style with one strand sticking upwards and Is there a reason for the "Hair of Death" hair style? This is nothing unique to all-out. This is infact so common in Anime that Tv Tropes has a page dedicated to it. You've been warned, TV Tropes link - Anime Hair. 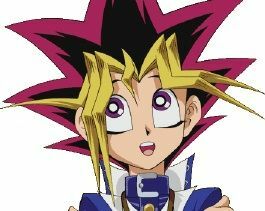 Take a look at the image of Yugi from Yu-Gi-Oh. Usually, the most important characters of the story will have wild spikes or a cool-looking hairdo in order to stand out among the crowd. It also helps to create a distinctive silhouette that will stand out in branding, media, and merchandise. It may be one or more different colors that don't appear naturally in real humans (blue is a popular choice). Sometimes the hair appears semi-transparent, with the character's eyes visible through it, although this presumably represents hair fine enough that it isn't completely obscuring, rather than anything outré. Anime Hair is very common among protagonists of anime/manga for the Shōnen (Demographic), although the trend seems to be headed to more plausible styles: compare Son Goku's hair to Ichigo's. 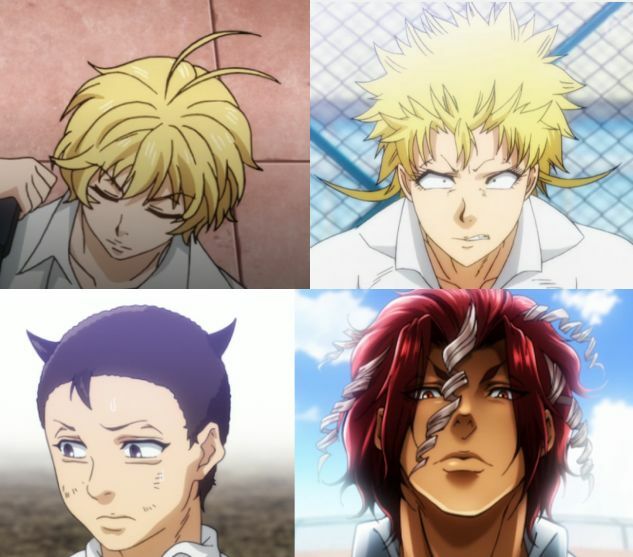 I would wager that these hair styles have no basis in reality, and are meant to give the viewer an opportunity to remember these characters as they factor into this anime. In that vein, I'd say it's worked; you can identify each of these characters by name, and they stick out in your mind. Not the answer you're looking for? Browse other questions tagged tropes all-out or ask your own question. Is there a reason for the “Hair of Death” hair style? What's with this up-tilted head posture? What's with this face in Nichijou? What's with the huge supernova-like explosions in anime? Who was the first young character in anime to appear with white hair? Is this end card fan drawn, or from the manga or anime? What's with awkwardness/fear with romance? What is the origin of the one-horned rabbit so common in fantasy and isekai stories?